When marketers truly understand how these two roles work together, it is a perfect synergy: The front-end content strategist envisions the solution, the back-end content strategist makes it happen. What defines the perfect content experience? While the question seems simple enough, there is a lot more to the answer than meets the eye. Why? Well, that’s another good question and, if you truly understood the intricacies of the content development process, the answer would be right in front of you. 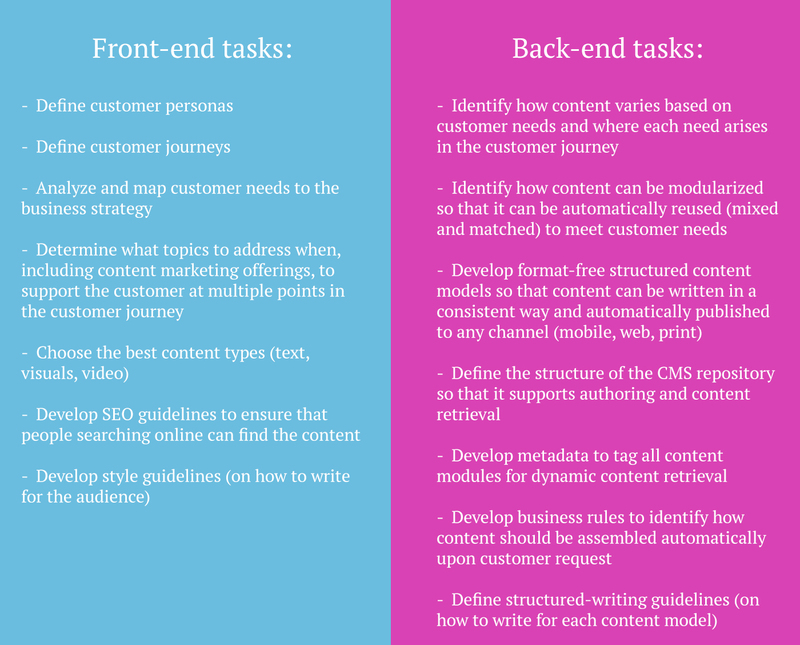 Content strategies are built upon two succinct premises: the front-end and the back-end. If you’re a marketer who treats your brand’s content as an asset, learning how both of these strategies complement each other is critical. As the founder and president of The Rockley Group, she helped introduce the concept of content strategy with the groundbreaking book, “Managing Enterprise Content: A Unified Content Strategy.” The Toronto-based company coined the term intelligent content, founded the Intelligent Content Conference and defined the methodologies and best practices for intelligent content, which kind of makes Rockley a world leader in the development and implementation of intelligent content strategies and structured content management solutions. In today’s content-driven marketing landscape, brands need to employ both front-end content and back-end strategies. Doing so means they can deliver content that wins over customers and achieves their business goals. As an example, Rockley remembers a large bank that was running a campaign to help its customers put the right investment and credit strategies in place. The bank had multiple customer personas ranging from single millennials, to families, to those soon contemplating retirement. While each persona had different requirements, many of the product offerings were the same. The front-end content strategists developed the messages and identified the customer journey, while the back-end content strategist determined the core reuse strategy and identified how the different persona messages could be layered on top of the reusable content. This ensured that the personalized messages were seamlessly delivered to each customer. “It was the most successful campaign they had to that date,” Rockley recalls. “There can be no front-end without the back-end. The best ideas for content strategy have to be supported by structured templates, metadata for search and retrieval and, of course, technology to deliver the content. Without coordination and alignment, the front-end may fail. If you’re looking to develop a content marketing strategy that works, you have to be able to coordinate the front-end and back-end strategies. When they connect, your message will perform the way you want it to with your customers and take advantage of automation. But this only works if you understand that front-end and back-end roles require different mindsets, both of which are equally important. Front-end content strategists typically love content and customer experiences, and make recommendations about the content itself. The front-end is where all of the business planning starts. On the other hand, back-end strategists are driven by structure, scalability and technology. They make recommendations about how to use technology—all of that hardware and software—to handle the content in efficient and powerful ways. When marketers truly understand how these two roles work together, it is a perfect synergy: The front-end content strategist envisions the solution; the back-end content strategist makes it happen. Front-end content strategists have a deep understanding of customer needs and optimum communication strategies. They are the ones asking who are the customers, what need are we trying to fulfill, what methods and channels do they use for information discovery, how can we help satisfy their need by providing the content that supports their decision-making or purchasing decisions? Back-end strategists are analytical, problem solvers, and have the ability to understand the front-end content strategy, and determine how to support it on the back-end for effective authoring development and content delivery. In the end, it’s all about finding the right talent for the task at hand. That means creating a space where the creative and tech-savvy warrior can build a program that enables your content to sing and dance its way into your customers hearts.